I was just going through Google Labs looking out for any new additions in it. 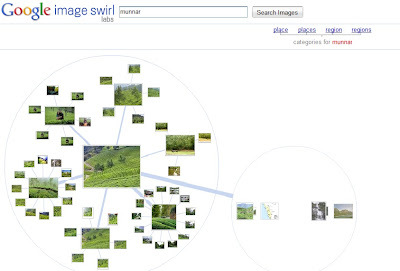 I tried out the Image Swirl feature which is quite old now,but would be nice if implemented in the main Google Image search. The next one which caught my attention was Indic Music Search which allows you to search and play Indian movie songs(currently only Hindi is supported) online. This again was released some time back,but I never remembered to actually try it out, until now. There were loads of great looking apps,but all were for android, and as I don't own any android devices or haven't started developing in it, I skipped them. But the apps were innovative and made me wish I had an android phone to try it out. One of them is Google Goggles, which allows you to search using photos captured in your phone camera. It is available for IPhone4 and Android.It seemed quite similar to my classmate at MEC , Sandeep's academic project. Afterwards, all the apps were quite old, heard of, or boring in nature. 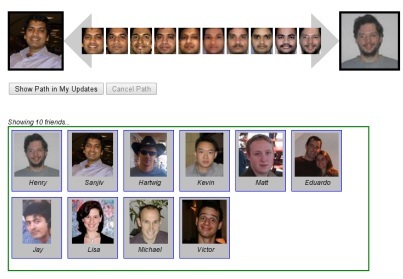 I just tried out one, named People Hopper, which basically is an app which shows the transformation path between the profile pics of any two friends, through your Orkut Account. It will be added as an app to your profile and you can drag and drop your friends (any 2 including urself) and the app will calculate and show the transformations that convert one photo to match the other. It was quite crappy for the pics I tried and looked surreal. Anyway nice concept..someone might believe its actually accurate. Thats it for time being..will be back with more updates on my view of this myriad world of technologies..